Is It Time for Us to Rethink How We Give Gifts? Giving gifts is an expression of love, and it has been for thousands of years. Well before our consumer-driven society, people offered gifts as a sign of respect and admiration. Kings, peasants, and everyone in-between. This is not an argument for no longer giving gifts to people we love. I think giving gifts is great. But I do think it would be wise for us to rethink how we give them. 28% of shoppers are entering the holiday season still paying off debt from last year’s gift shopping! Over 50% of holiday shoppers either overspend their holiday budget or do not set one at all. Consumers who went into debt over the holiday season racked up an average of $1,054 in new debt over the timeframe. 53.1% of people report to receiving unwanted gifts during Christmas. $16 billion is wasted on unwanted gifts every year. Some reports indicate up to 18% of gifts are never used by the person who receives them. 4% are immediately thrown into the trash. And none of this even begins to mention the amount of stress and worry piled on to the holiday season with our attitudes toward gift-giving. I think it’s time we rethought how we approached the act of gifting gifts during the holiday season. Our current approach is not benefiting the people we love, nor is it adding to the joy of the season. For one, material goods exist in far greater excess than ever before. Consider this, human beings own more “things” today than at any point in human history. In America, the average home has tripled in size in the last 50 years. And still 10% of Americans rent offsite storage to house their stuff… and an even higher percentage can’t park their car in the garage because it’s too full. We’ve reached peak-stuff. People don’t want more, they want less (the growth of this blog and the minimalist movement over the years since it began stand as proof). Additionally, and probably more important, very few people wait for the holidays to receive what they want anymore. Because goods have become so accessible and inexpensive, a high percentage of people just go buy whatever they want, whenever they want. This leads to countless moments of saying, “I don’t know what to get __________, he already has everything.” I can remember that phrase being said 30 years ago. But nowadays, it’s true about far more people than ever before. I honestly think it’s time for us as a society to start rethinking our holiday gift-giving attitudes. This has happened before. Most historians trace our current attitude toward Christmas shopping back to the 1850’s. This may seem like a long time ago. But 150 years, compared to the timeline of human history, is not all that long. Our thinking as a society toward gift giving has changed in the past, and it can do so again. How do we bring about this change? 1. We keep the conversation alive. Share this article. Or share others that are similar. Start the conversation among your friends and family members. 2. Control what you can. Request a change in what you personally receive. Ask for no gifts this year or ask that the money be donated to a charity rather than spent on clutter. 3. Look for buy-in among like-minded people. Or look for new traditions in your family. Maybe you only buy gifts for people under the age of 18. Or decide to limit the amount of gift-giving stress by drawing names, rather than everyone buying gifts for everyone else. Approach the conversation with your family. Many families have changed how they give gifts, and most people are thankful for the change. It usually just takes one person to approach the others with a new idea. But now is the time to have that conversation. 4. Find new ways to give gifts. Look to consumables, experiences, or pooling money for one significant gift rather than piles under the tree. 5. Find new ways to make the season memorable. Holidays are important. They establish tradition, stability, and shared experiences among family members. 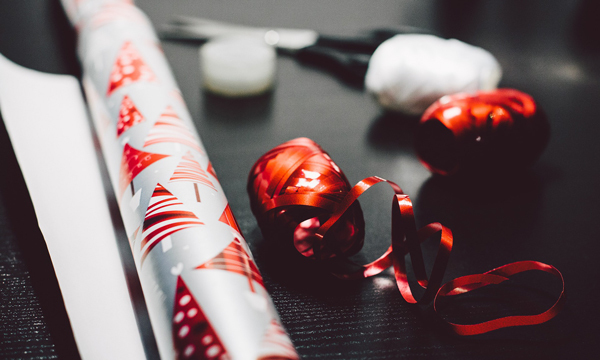 Look for new ways to promote memories (time together, meals together, religious experiences together) that do not center around stuffing used wrapping paper into a trash bag. It will take effort to change societal expectations around our current gift-giving habits—especially with the amount of money being spent to encourage it. But we can start with our families, and allow them to enjoy the freedom of new expectations first. Last year, mostly out of financial necessity, my husband and I sat out the holiday season. We bought our daughter a pink matchbox car because it was the only thing she consistently asked for, and somehow we knew none of the family was going to get her what she actually asked for. She still treasures it a year later. The experience made us see so much in a different light, both about ourselves and our family in terms of the holidays and gift giving. We have committed to being people who don’t exchange gifts at Christmas and I’m so excited to see what it teaches us this year! I wrote a blog about it, I put the link to it in the “website” option. Your post is so true. It’s that feeling of guilt that lingers the most. “guilt is self-induced.” give YOURSELF a gift and stop feeling guilty. Let things be what they are. Bigger/more expensive is not always better, Rachael. I don’t know your situation, of course, but it is possible to do less and not feel guilty. My husband got me a package of card stock (paper) for a gift one year. Not expensive or unique, but it was *exactly* what I wanted and thus was perfect. Go for it and do less! You may well be (I hope you are!) pleasantly surprised by the results. Instead of sending Christmas clients to 100 clients I give the equivalent spend Dollar amount to a local food bank. Last year the $250 donation paid for turkeys for a dozen families at Xmas. I received many emails from clients saying what a wonderful gesture it was. Never received any acknowledgement from them over the years for the Xmas cards. This year our local animal shelter is matching donations in December so that’s where the money is going this year. Another benefit is the lack of paper waste from all those cards. Receiving a thank you for no card / donation tells so much! Keep sharing your experience and others might join you! Thanksgiving is my favorite holiday too for the same reasons, family and friends and no gifts required! We got fed up with the excess of Christmas, and seriously scaled back. The toy mess from 4 kids was killing me. I either threw away or sent to a local thrift store (sorted usable vs broken) between 60%-75% of their toys, and we still have more toys than I would like. And I only kept things like Legos, a kitchen set with food, and dress up. The sad thing was we hardly did an extravagant Christmases, but wow, it still added up. So a few years ago, we talked to our kids about how blessed they are, and how their needs really are met and they don’t actually want for any of the real things in life. We asked them if they would be willing to pool the cost of their Christmas presents to each other, and the cost of their presents from us and donate the corresponding funds to a child based charity to help children that are less fortunate than they are. They all enthusiastically agreed with it. Best decision we ever made! They still get something from grandparents, and a stocking with a few little consumable treats (oranges, nuts, chocolate, and usually a fun pen set and notebook type stuff) but the mass of mess is not overrunning our lives. It has made them so much more aware of those around them, and helped them to be more compassionate for others. Hubby and I usually will get something needed for the house of family and pool the Christmas presents for each other that way. Then it’s something needed, will be used, and not a waste. I love doing that. The rich giving to the poor on one day? It harks back to Victorian times when the income gap gap between rich and poor induced revolutions. Once you realize you’re just choosing an alternate set of traditions, it becomes so much easier to go against someone else’s. Two years ago I decided to “shop at home” for 25 family members. Among the gifts I found at home were my husband’s grandfather and father’s tools and toolboxes, many dating from the 1880’s, an antique pocket watch, 1956 Notre Dame collegiate jacket (my husband’s), a set of dishes, camping equipment, and board games. In addition to the items we shared family stories. Shopping consisted of finding the right cleaning solutions and packing material. We had a great time finding each person the right gift and our children, grandchildren, and great-grandchildren each enjoyed their gift. I even found a book and some stationary for my mom. This year I am giving consumables: local foods and treats I will make myself. My husband and I did the same thing. We have so many antiques and family heirlooms and are planning on selling our house so we picked something for each of our 7 children that seemed appropriate for each and that was their gift. They loved It! AND family things stay within the family. We concentrated on spending as much time as possible together…that was the second gift. This is so wonderful and inspiring! I’m going to ask my parents if they can do this. My mom and dad are preparing to downsize to a new home and are stressed about getting rid of things – many of them heirlooms inherited from their parents/family members. I think this is so special – and you’re right it keeps family items/memories in the family and passes along a new memory. I’ve really been struggling with how to make Christmas less about stuff and more about meaning for my own children, who are 5 and 8. We’ve encouraged them to ask for things they need – new pajamas for instance – and experiences (going to the movies) as opposed to just additional toys. We have decided to limit the items we give to games, art supplies, and Legos, and other useful items. And I’ve also decided to let them help us clean out their items to donate before the Holiday. This is such a refreshing perspective ! I am ( currently) in the process of declutterring our home of old , unused and unwanted stuff . It is emotionally painful to touch and toss / give away these treasured items . They represent a former time of joy . But now – as I de clutter – it represents clean and new beginnings ! This year for Christmas, I decided to spurn the usual frantic gift buying ( I truly am not a shopper anyway) and am writing each family a check to do with as they please. My grandchildren who range in age from 21 to 5 are generally the recipients of the gifts so there was some guilt involved but I decided to do it anyway. Their needs and wants are more than met. Gifts for them is trending towards money these days as it is. The parents constantly complain about the amount of “stuff” that all of them have and, honestly, I no longer have a desire to contribute. Besides I have no idea if they even care about what I give. Sad. The only side effect is that I feel a distance forming with me and my kids as there is no collaboration around choosing gifts. They are not even doing a gift exchange between the adults this year. At times I feel this may be my doing as I lost my last sibling and only remaining family member this year and have withdrawn a bit myself. They all know my decision to gift cash instead of stuff and had no problem with it. Perhaps they too are rethinking the greed the season brings. I have long railed against the commercialism of Christmas. I know that one son’s wife’s family does not support my way of thinking but, they are not my problem. So, without the “noise” associated with the commercialism of the holidays, they will be quiet days indeed. I am single, though, so most days are quiet anyway. Cleo, instead of just writing a cheque, which seems to make you feel more disconnected from your children and grandchildren, why not give them an experience in lieu of “stuff”. Take them to a show, a day at the museum or zoo with lunch, a sporting event, or anywhere else that you think will appeal to them. You will get to spend more time with them, there is no need to shop or wrap, and nothing will end up in the landfill. Last year, I gave a wine-tasting afternoon, an escape room adventure with dinner, and a trip to see a major league baseball game to various people. Everyone loved the gifts and it only took me a few minutes online to arrange all of them. I have asked my husband not to buy me anything for Christmas this year, but he says he feels guilty not buying anything. I replied, I already have everything: my health, a healthy family, a loving husband and a nice warm home. What else is there? I feel pretty blessed with those things without anything else! I hope he looses the guilt and follows my wishes. It’s the festive adverts that make us all feel guilty. Amen! I wholeheartedly agree. I No longer allow anyone to give me gifts. If someone does I donate it! When our children were very small we began a 12 Days of Christmas tradition. I wanted them to focus on others, so we would choose someone in our neighborhood who was alone, suffering illness or loss, a single mom, you get the idea, someone in need of blessing. We always chose to be anonymous and delivered one bag each day or night before. Count backwards from Christmas eve so you’re not delivering the last bag on Christmas day. We would use brown paper lunch bags and write with red or green marker- On the 1st Day of Christmas, On the 2nd day of…., etc., and tied them with bows or ribbons. Each bag held as many items as the numbered day. One year we decided to bless an elderly couple we knew only from waving as we walked past their home, we did a dry run to find they had a motion sensor light, so their bags were boxed with instructions to open one bag a day and we delivered all at once. My children have countless stories of our ‘missions’ and the people who blessed us without even knowing. Christmas is about the heart, I guess that’s why the Little Drummer Boy is my favorite carol. What a wonderful tradition- thank you for the ideas! wonderful idea; I’m already making plans to do similar this holiday season~thanks for a great new tradition! Several years ago, ou little tow never had a factory shut down. Many families were hurt, right at Christmas. We were also drowning in stuff. So, we talked with our children, told them that we were going to spend our Christmas money on others, secretly. We all loved it! We printed off a pretty paper, telling them how much they were cared for, by us and by God, and filled bigger stockings with useful presents. A few years later my husband’s lifelong neighbor, who helped raise him, was dying of cancer. She fell down, and I was called to help her. After we got her up, resting, she asked for a cup of coffee. On her refrigerator was that piece of paper we had made for her stocking. We had never told anyone it was us, but she asked me that day, and with tears in her eyes, said she read it daily. Best present ever. She was the most gracious and sweetest person I have met. I recognize the season for what it is – winter solstice. I agree with you 100%. My inlaws give us guilt trips in the name of religion. We’re not religious, and they are fanatics. If everyone would realize what Christmas is truly about, we wouldn’t even be having this conversation. We are celebrating Jesus’ birth. Have you heard the saying “Jesus if the Reason for the Season”? Too bad most people forget. Sorry for the typo. Jesus is the Reason for the Season. This was a very excellent and truthful post. For Christmas I usually start my shopping four months in advance. I make sure it’s something that the person can use, and likes. Instead of buying a lot, I buy what’s useful. More thought, less gifts. Also I’ve gotten rid of lots of stuff the last few years. I like living with led stuff because I only keep what I use. Now I have less stuff to worry about and more room, and I love it. Be careful with holding onto gift cards. I bought a $100 Kroger gift card at Kroger in late September. When the recipient tried to use it the other day, it only had $5.54 left on it. I still had the receipt. I called and after a long wait, found out the card was compromised on October 14. Someone copied the numbers and waited for it to be activated. They can do this with their phones. They didn’t need to have the actual card to drain it. I reported the problem to the store manager and am waiting for a refund. Black Friday: a day when people don’t hesitate to trample others for stuff they don’t need mere hours after giving thanks for what they already have. I try and give the adults on my list something that they can either eat or drink. Gifts like a bottle of wine, ground/whole bean coffee (depending on how they brew it), gourmet candies (great locally owned candy shop nearby that makes everything on site), baked goods, etc. That way the gift is enjoyed and won’t collect dust. That has backfired with me… people get too much sweets during the holiday season, and it goes to waste. Or they have allergies to (eggs, nuts, soy, dairy). Or their health requires a diet change of no (added sugar, saturated fat, alcohol). My son has long been a minimalist. His present to me every year is a big box of persimmon from the tree in his yard ( can’t grow them where I live ) and my gift to him is home made biscotti. We’re both happy ! When buying physical gifts for anyone, even myself I think about where that item will be in 1-5 years. Will the recipient still want it in their life? I also like to think about what that person actually wants, not what I want to give them. My family always askes for their favorite cookies or candy from me. I am happy to send them a little piece of home. I remember last Christmas morning the feeling of anxiety staring at the PILES of toys me and my wife bought to our children. Now I know : it’ll never happen again. I’m gonna buy just one thing with which we can play TOGETHER, this is the very gift to them. I agree, mostly…However, a do have some friends for whom gift-giving is their love language. I have one friend whose gifts show how well she understands me–they are usually things from her home that she no longer uses, but that are perfect for me! But yes, I am not impressed with gift-giving out of obligation. We have lived this lifestyle long enough, that most people give gift cards, which are perfect! I rarely have to pay to take my daughter to the movies, thanks to our loved ones’ generosity! Loved reading all these comments and ideas for a less stressful and materialistic Christmas. This year it’s cash for everyone, from the adults down to the 5 year old. The parents of the younger ones can go buy what they know their child will like and it can be from Grandma and Grandpa. The adults can always use cash… the teens like saving for a large purchase. The checks are going in the mail, and I don’t have to shop, wrap, and then mail the gifts which ends up costing me twice as much. Christmas shopping is done in a matter of moments! Hooray! I get to watch everyone else running to and fro! Merry Christmas everyone! I’m retired. I make all my gifts. Teaching my grandchildren to do the same. I like to make things for Christmas. One year I crocheted blankets for my sisters and children. I give my nieces and friends handmade jewelry in their favorite colors, one year necklaces and another year bracelets with a dangle that says “love you to the moon and back”. Last year I crocheted hand towels and face clothes out of the softest chenille yarn and scrubbies for the grandchildren I put each person’s gift in a basket I bought at goodwill and some soap or shower gel. This way the get to use it all year rather than something thrown out after they get bored with it. I realized that giving doesn’t always equate to helping. There are times when the thing we give adds burden to the person who received it. Personal experience: my mother-in-law is an amazing woman. She loves to give me things—bag, sandals, lipstick, among others. As much as I love the idea that she is generous towards me, I am burdened by most of the things she gives to me. I don’t want to seem ungrateful and hurt her feelings, so I don’t tell her to stop giving me anything. (When she visits another country, she always asks me what I want and I always tell her that I don’t want anything. She’ll end up giving me something nonetheless!) She is a lovely woman, that’s why I don’t have the heart to tell her that gifts aren’t welcome anymore. But this experience made me rethink every time I want to give something to someone. Will it help them or burden them? If it’s the former, I’ll push through. If it’s the latter, I’ll back off. Backing off, most of the time, is the best gift we can ever give to our loved ones. No, we don’t turn our backs from them, but we take a step back and savor the moment because we saved them from drowning in material things. Last year for Christmas we took my parents to dinner and also a dear friend, rather than buying them gifts. They’ve asked to do it again this year, which we will, reservations are already made! We give our grown children checks and fill stockings for them with small gifts (not always inexpensive, but things we know they will enjoy) and if they would like a gift rather than a check, we let them choose and order it for themselves. We still get gifts for a few family members, but they are tokens. Even our new granddaughter, our first grandchild will only get a few gifts, along with a check for her college account which we have set up for her. We also either buy one small gift that we’ll enjoy together or none at all…we just enjoy each other’s company and that of our family on Christmas. That is gift enough! This year our neighborhood started a Buy Nothing Facebook group. You simply post things you do not want and people respond if they want it. Likewise you can post a request for items you’re searching for and if someone has it they can offer it up. Someone seeking a rice cooker made me realize I had one I wasn’t using and was happy to give away! There is no trading or exchanging, simply gifter or giftee. It has been shocking to see how much STUFF people are giving away – me included – most of which has been sitting around our homes unused. It’s also made me recognize the importance of donating on a person-to-person basis. Several people in our neighborhood have fallen on hard times and through this holiday season collectively our neighborhood has been able to help by providing Thanksgiving and Christmas items – from holiday meals and decorations, to items they can use as gifts for their children, etc. It’s so rewarding, and it also makes it easier for me to part with ‘nice’ items knowing they are going to someone who will appreciate and use them, rather than an anonymous Goodwill. I generally hang on to stuff I don’t need or use anymore because I hate the idea of it just going to waste among the hoards of other items in thrift stores, and this way I know that these items are getting a second life. Anyway I would highly suggest starting a group like this in your neighborhood if you don’t have one, or joining if you do! It’s helped me connect with neighbors, become more involved, and de-clutter! YAY. At my workplace we have a giving column in our company’s newspaper where an employee can ask for or donate an item. Even if they don’t use the item they might know someone who could use it. You help someone and keep useful things out of the landfill. Thank you for sharing. Stopped buying Xmas gifts many years ago. For the grand kids we had Papa day instead. The weekend before Christmas I would take both grandkids for 2-4 days and do whatever they wanted .. a weekend in Niagara Falls, a weekend in Toronto including the Aquarium and CN Tower, indoor sky diving, go-kart racing whatever they wanted. Some of my very best memories. My husband and I stopped giving each other gifts several years ago for all occasions; birthdays, anniversaries, Christmas, etc. We save the money we would spend on gifts for each other and use it to travel. So far we have been to England, Scotland, Spain, Iceland, Wales and the Netherlands. The memories and friendships we have made last longer than any material item. My grandmother decided to give her children and seven grandkids an “experience” instead of gifts for the first time this year. So this Christmas, instead of nice things we do not necessarily need, we’re all heading off to a beautiful hotel at a famous estate with great gardens, a castle, fun activities and fancy food. She’s thrilled with herself because all of her grandkids can’t stop talking about it, and we are thrilled to get to do such a fun thing for the holiday instead of normal presents! For the last two years my daughter asked for no more toys for her now four year old twin girls. Last year she asked that gift money be given for year long passes to the zoo. This year the gift money will be used to purchase an outdoor gym set for the girls. I certainly don’ t mind because it lessens my shopping burdon. My brother in law had a very, very wealthy son who had young children of his own back in the ’80s. A six year old boy was given every imaginable toy and battery powered gizmo imaginable but his preferred gift by far was a worn out old electric drill given to him by his observant and very wise grandfather. This can also be applied to weddings, they are so expensive, and for what? Half end in divorce. When all you need is a justice of the piece and a simple ceremony. In the end, it’s all the same. Your married with a piece of paper. I totally agree! I have friends that have spent over 50k for ONE night or their life. That is crazy to me. I always think of it as “that could be 30 vacations with years of memories.” To each their own, but I wouldn’t be able to sleep if I spent that much for a one night wedding celebration. No way. We did the white elephant gift exchange this year with my sisters and their families and my mom. It was SO nice to not have all the presents. Less anxiety for sure. It was fun and easy- less wasted money on things people didn’t want or need. Creates more time to spend together rather than shopping and opening so many gifts they probably won’t like anyways. Ha! Even the kids liked it. I got a waffle iron (which I still may not use), but I really don’t even care about the gifts. I just want to spend time with family and then go home to my dogs 🐶. Our family has adopted some of these same new traditions. Only giving to Grandchildren, some years white elephant or one person gift exhange. I think donating to the needy we could do more of. But my question is what is up with the euphoria I feel with the trees, lights, wrapping paper, ribbons and bows. Seriously, the picture in your blog of the beautiful red and silver wrapping paper just hits my pleasure Center like this choir singing. It’s like an addiction.